_ For a one-time fee of $ 199, the Class Pass entitles student to enroll in unlimited classes May 1, 2019 through October 31, 2019. 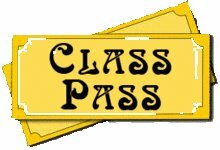 _ Class Pass excludes Clubs or Gatherings including, but not limited to P.M.S., Strip or be Square, Block of the Month, Casual Friday, or special event classes. _ One pass per person. Pass cannot be shared or transferred. _ Pass is Non-Refundable. Pass has no monetary value. _ The Class Pass is used for payment for classes only, not supplies. _ Class Pass must be paid for upfront, in full. Previous class fees will not be applied to a Class Pass purchase. _ A student may only register themselves for a class, no other Class Pass or Class Ticket students. _ Currently, you are not able to register for a class online using the Class Pass. _ If registering in person or on the phone, let us know that you have a Class Pass, including Pass number. _ Classes have a limited number of students, as well as a minimum to make the class a go. When you register with your Class Pass, one of those spaces is reserved for you. After the class limit is reached, interested students are put on a wait list. Classes also have a minimum number of students to make the class a go. The teacher prepares for the number of students registered. _ When you register for a class with a Class Pass, you are expected to show up for the class. _ Any pass holder that needs to cancel a class must cancel at least 5 days prior to the scheduled class. _ Any pass holder who is a “no show” or cancels less than 5 days prior to a class for two classes will have their Class Pass voided. _ Class Pass fee will not be refunded if Class Pass is Voided.